The VISI suite of CADCAM applications from Vero Software has been instrumental in helping a precision engineering company develop the world’s most advanced commercially available myoelectric prosthetic hand currently on the market. Delta Tooling (Horsham) Ltd was approached some two years ago by prosthetics specialists RSLSteeper to assist in the manufacture of the bebionic3 prosthetic hand, which is transforming the lives of amputees worldwide, helping them to regain independence and control in their everyday lives.The bebionic3 utilises leading-edge technology to trigger one of 14 programmed grips, perfectly mirroring human movements. Being the culmination of many years of work from RSLSteeper, the bebionic3 hand is designed so that its unrivalled versatility, functionality and performance allows its users to carry out everyday tasks such as using a computer keyboard, tying shoelaces and chopping vegetables. As part of that process Delta Tooling find VISI Machining’s collision control and kinematic simulation extremely valuable. “Having made a major investment in a new 5-axis machine, the last thing we want is to cause a collision. We always run full kinematic simulation prior to any production run.” A new feature in VISI 20 which Gary Childs says represents “a huge step forward” for them is the dynamic incremental stock (DIS) command that automatically creates the stock model from the uncut material of previous toolpaths, to be used as reference data for subsequent milling operations. 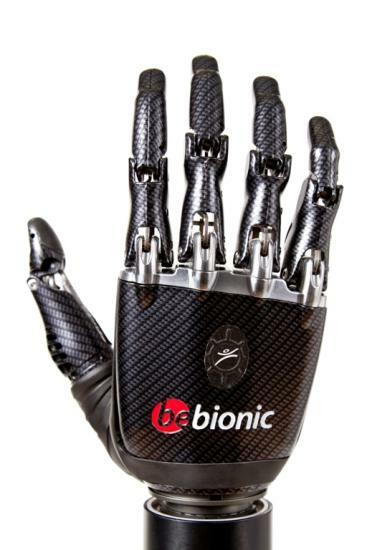 The bebionic3 was unveiled worldwide in the United States in September, and subsequently introduced to the United Kingdom at a London launch in November. It looks as if RSLSteeper’s design innovation along with VISI and Delta Tooling’s expertise will ensure the product’s future progression and manufacturing for a long time to come, maintaining RSLSteeper’s vision of improving amputees’ lives.